It was an appealing idea, but at the time it was complete speculation. No one had shown that RNA could catalyse reactions like protein enzymes. It was not until 1982, after decades of searching, that an RNA enzyme was finally discovered. Thomas Cech of the University of Colorado in Boulder found it inTetrahymena thermophila, a bizarre single-celled animal with seven sexes (Science, vol 231, p 4737). RNA molecules are strings of nucleotides, which in turn are made of a sugar with a base and a phosphate attached. In living cells, numerous enzymes are involved in producing nucleotides and joining them together, but of course the primordial planet had no such enzymes. There was clay, though. In 1996, biochemist Leslie Orgel showed that when “activated” nucleotides – those with an extra bit tacked on to the phosphate – were added to a kind of volcanic clay, RNA molecules up to 55 nucleotides long formed (Nature, vol 381, p 59). With ordinary nucleotides the formation of large RNA molecules would be energetically unfavourable, but the activated ones provide the energy needed to drive the reaction. This suggests that if there were plenty of activated nucleotides on the early Earth, large RNA molecules would form spontaneously. What’s more,experiments simulating conditions on the early Earth and on asteroids show that sugars, bases and phosphates would arise naturally too. It’s putting the nucleotides together that is the hard bit; there does not seem to be any way to join the components without specialised enzymes. Because of the shapes of the molecules, it is almost impossible for the sugar to join to a base, and even when it does happen, the combined molecule quickly breaks apart. This apparently insurmountable difficulty led many biologists to suspect to RNA was not the first replicator after all. Many began exploring the possibility that the RNA world was preceded by a TNA world, or a PNA world, or perhaps an ANA world. These are all molecules similar to RNA but whose basic units are thought to have been much more likely to form spontaneously. The big problem with this idea is that if life did begin this way, no evidence of it remains. “You don’t see a smoking gun,” says Gerald Joyce, also of the Scripps Research Institute. Instead he wondered whether simpler molecules might assemble into a nucleotide without ever becoming sugars or bases. In 2009, he proved it was possible. He took half a sugar and half a base, and stuck them together – forming the crucial sugar-base link that everyone had struggled with. Then he bolted on the rest of the sugar and base. Sutherland stuck on the phosphate last, though he found that it needed to be present in the mixture for the earlier reactions to work (Nature, vol 459, p 239). Sutherland was being deliberately messy by including the phosphate from the start, but it gave the best results. That’s encouraging: the primordial Earth was a messy place and it may have been ideal for making nucleotides. Sutherland now suspects there is a “Goldilocks chemistry” – not too simple, not too complex – that would produce many key compounds from the same melting pot. The issue isn’t entirely solved yet. RNA has four different nucleotides, and so far Sutherland has only produced two of them. However, he says he is “closing in” on the other two. If he succeeds, it will show that the spontaneous formation of an RNA replicator is not so improbable after all, and that the first replicator was most likely made of RNA. Many questions remain, of course. Where did the first replicators arise? What was the first life like? How did the transition to DNA and proteins, and the development of the genetic code, occur? We may never know for sure but many promising avenues are being explored. Most biologists think there must have been something like a cell right from the start, to contain the replicator and keep its component parts together. That way, individuals could compete for resources and evolve in different ways. Jack Szostak of Harvard University has shown that the same clay that produces RNA chains also encourages the formation of membrane-bound sacs rather like cells that enclose cells. He has grown “proto-cells” that can carry RNA and even divide without modern cellular machinery. 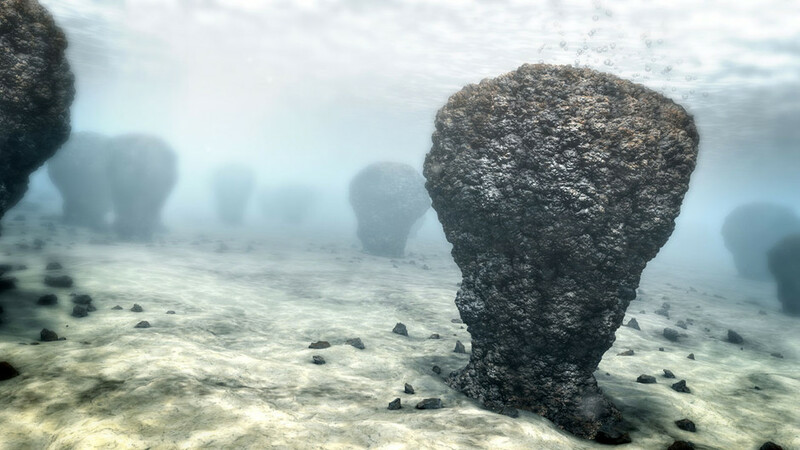 Another idea is that life began in alkaline hydrothermal vents on the sea floor . Not only are these vents laced with pores and bubbles, but they also provide the same kind of electrochemical gradient that drives energy production in cells to this day. Conditions may have been ideal for producing long RNA chains. Holliger has a rather surprising idea: maybe it all happened in ice. At the time life began, the sun was 30 per cent dimmer than today. The planet would have frozen over if the atmosphere hadn’t been full of greenhouse gases, and there may well have been ice towards the poles. Cold RNA lasts longer, and ice has many other benefits. When water laced with RNA and other chemicals is cooled, some of it freezes while the rest becomes a concentrated brine running around the ice crystals. “You get little pockets within the ice,” Holliger says. Interestingly, the R18 RNA enzyme works better in ice than at room temperature (Nature Communications, DOI: 10.1038/ncomms1076).